Given freedom, they are warm, affectionate, funny,and interesting companions. The adaptability of Sagittarius gives ambidexterity to its subject and enables them to tackle more than one thing at a time. Concentration is not their strong point, however, and they often become unstuck when talking on too much. Their love of change and variety makes them fascinating but unreliable .Projects are started but not finished, appointments and promises are made but not kept, and words are spoken which mean nothing a few days later.Sagittarians listen earnestly to advice but rarely follow it.They are easily able to forgive and forget. Regarded as the luckiest sign of the zodiac, Sagittarius always appear to land on their feet. They can be reckless and foolhardy, and children of this sign are often prone to accidents. Sagittarius are known for their bluntness and what they perceive is plain honesty. Diplomacy is an alien word to them. They are great storytellers. Sagittarians are generally open-hearted, social, and friendly and hence all the other zodiac signs enjoy better compatibility with them. They do not have any hidden agenda in store for their partners and are quite easy-going. They hold their partners in high esteem and respect their wishes and desires in life. Sagittarians are straight to the point and very honest in relationships and expect the same form their partners. Only those signs that can take them as they are other without any strings attached can survive a relationship with the Sagittarius. Of course, Sagittarius are too direct at times for the partners to handle. 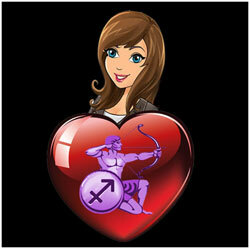 Sagittarians are attractive for potential partners by their great sense of humor and adventure. Also they do not take life much seriously. They do not worry much about relationship or partners or compatibility but simply believe that true love will come at a destined time from a destined source. However the fun-loving and independent nature of the Sagittarians might be quite intimidating for the other zodiac signs to forge a relationship as they seem non-committal. Possessive signs of the zodiac would suffer a lot due to incompatibility issues with the Sagittarius natives. Also the restless nature of the Sagittarians would be a negative side for compatibility issues. The earthy signs find it a little difficult to get along with the Sagittarians in that they cannot stand the wanderer for long. Certain signs like Aries and Aquarius would find the going easier with the Sagittarius as they have a similar free adventurous spirit. 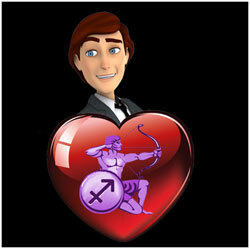 The sensitive signs among the zodiacs cannot get well with the Sagittarius as they lack in emotions and feelings. A certain level of compatibility however exists with the watery signs and depends on how well the individuals take life. Sagittarians make great philosophers and take their partners in life for best friends. Hence compatibility with a Sagittarius native would be a bit on the easier side for the other zodiac signs if they are willing to get along their adventure path hand-in-hand.